Letters & Numbers & Symbols – Oh My! Everyone knows the familiar “ABC” song (which sounds strangely similar to “Twinkle, Twinkle, Little Star” . . . ). Now our PreK 3 friends are learning all about what happens when letters are combined to form words, and how we use written words and symbols to communicate! 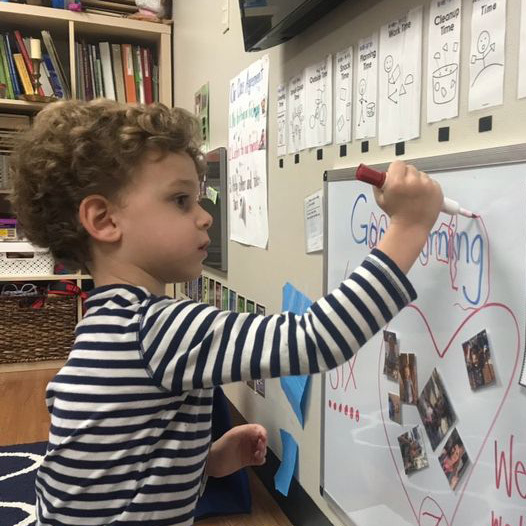 Since returning from winter break, PreK 3 has been studying the “Signs and Symbols” unit of inquiry, a focus on how letters, numbers, and words convey meaning. They first focused on traffic signs and symbols, as well as familiar logos of favorite stores (Publix, Target, McDonalds). They then made connections between signs and symbols in the community to books and activities in the classroom, including a symbol-scavenging hunt on the playground. After discussing symbols, the students moved on to letters and numbers, and have worked on writing their own names using a pencil, playdough, magnetic letters and beads. With Miss Meredith during inquiry time, the students read and acted out the Chicka Chicka Boom Boom story, complete with a tall palm tree and falling letters! They also ready The Very Hungry Caterpillar, then worked together to sequence the story on their own. A favorite classroom activity is bingo. When playing bingo (ABC, numbers, or environmental print) children are not only gaining confidence as emergent readers by identifying the signs and symbols from the world around them, but they are also practicing important skills such as taking turns, sharing, listening, and visual discrimination. Click here to see our young communicators. Signs and Symbols is part of the IB Primary Years Programme Transdisciplinary Theme: How We Express Ourselves. Throughout the PYP (taught to children ages three – fifth grade), the transdisciplinary themes focus on issues that span subject areas. How We Express is an inquiry into the ways in which we discover and express ideas, feelings, nature, culture, beliefs and values; the ways in which we reflect on, extend and enjoy our creativity; and our appreciation of the aesthetic.